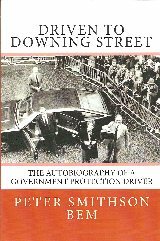 THE AUTOBIOGRAPHY OF A GOVERNMENT PROTECTION DRIVER by PETER SMITHSON BEM. From humble beginnings in a miner's cottage in County Durham to his own office in No.11 Downing Street with friends at the highest level of government, this story wends its way from a childhood of poverty in the North of England, through anxious times during World War II, followed by an exciting life in the RAF and service in Malaya, to a gradual progression through the ranks of the Government Car Service where he enjoyed a very eventful career as a protection driver in the company of Special Branch protection officers before becoming the senior driver. He describes in detail his RAF 'square bashing' at West Kirby, followed by service at RAF Kirkham, Marham, Scampton, and Upwood before being posted to RAF Tengah in Malaya. After joining the GCS, Peter offers his own unique insight into some of the most important events in modern British history including the Brighton bomb at the Conservative conference where he was staying, Geoffrey Howe's relationship with Margaret Thatcher and the dangers posed by IRA. He gives a revealing 'behind-the-scenes' account of his time with Government Ministers at the highest level, including Harold Macmillan, Sir Geoffrey Howe, Sir Alec Douglas Home and Richard Crossman. He also recounts interesting meetings with famous people such as Sir Winston Churchill, Selwyn Lloyd and Margaret Thatcher as well as important foreign personalities including President John F. Kennedy, President Gorbachev and the Aga Khan. Finally Peter achieved his ambition of becoming the permanent driver for the Foreign Secretary (Sir Geoffrey Howe) who he drove for 24 years when he served in Thatcher's cabinet as Chancellor of the Exchequer, Foreign Secretary and then Deputy Prime Minister and subsequently when he entered the House of Lords. A keen an active member of the RAF 7 Squadron Association, he was particularly pleased to meet up again with old comrades from RAF Tengah, including Mike Marshall Ride and the late and sadly missed Secretary Ron Mole, as well as the more recent members of the squadron who are now based at Odiham. See the next two pages for 7 Squadron Aircraft Prints. 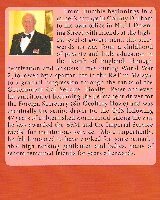 See "Membership" page for details of Squadron/Association Long and Bow-ties. See the next two pages on the "Association Shop" link for details.